2018 sees the introduction of an all-new Honda Accord, designed from the ground up for a brand new generation. The next-gen 2018 Honda Accord features a totally redesigned style, an interior crafted from premium materials, new technology, and three capable powertrain options that let you ride in style. The redesigned Accord is coming to dealerships fall of 2017, so be ready to grab this ground-breaking new take on a classic and beloved nameplate. Powertrain options for the 2018 Honda Accord include two turbocharged engines – a 1.5-liter and a 2.0-liter – as well as a two-motor hybrid system for more environmentally-friendly fuel economy. Additionally, Honda Sensing® safety systems will now be standard, with features like the Collision Mitigation Braking System™ and Traffic Sign Recognition coming with the base model. The new Accord will also feature the most innovative tech ever seen on the nameplate, though specifics will have to wait until vehicle launch. If you’re curious about the all-new Honda Accord for 2018, keep an eye out for more news here at Hardin County Honda. 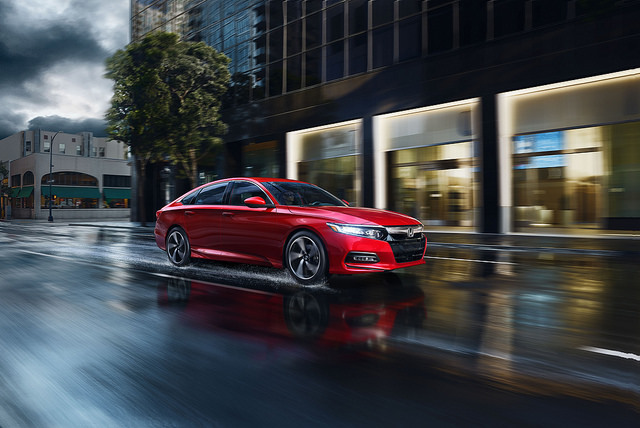 As soon as the new Accord debuts, you can swing by for a test drive and more information on how this new generation is the most advanced Honda Accord yet.